The Bring Together collection creates home as meditative place through a flow of conversation (image 1) from entering through your door (Flow In), to the hearth (Gather Light), and to window (Inside Out). It is not a hard boundary but a transition. It is one way to connect to your pure moment, the moment that you and your senses are having a conversation, and relief / healing you feel from an overwhelming schedule in an overloading world. My Bring Together collection is a spatial concept that I translated into my graduation show display (held in April 2016). The transition of a home space (image 2) is made by a wall structure separating the inside and out. 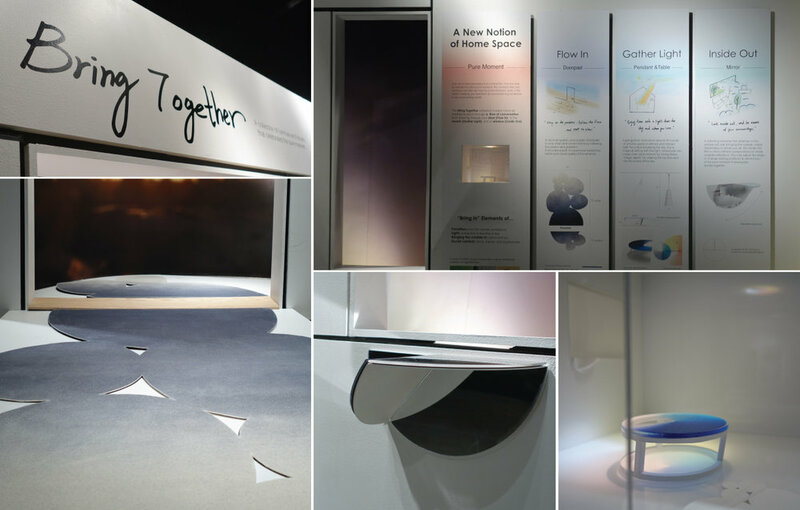 The collection is displayed as a “virtual home” which demonstrated the spirit of boundary-free space and pure moment. A reflecting reminder that attaches to the window sill/ wall bringing the outside, inside. Depending on where you sit, the Inside Out Mirror offers different juxtapositions of inside/outside reflections. You may adjust the angle or change seating position to remind you of the pure moment of seeing two worlds together. Handwriting Logo and notes are used because it feels more human and presents a more personal and emotional quality similar to that of seeking a pure moment. The four gradient palettes brings up a sense of rejuvenation and relaxation as you go through the process of seeking and enjoying a pure moment in different spaces in your home, from door to hearth to windows.